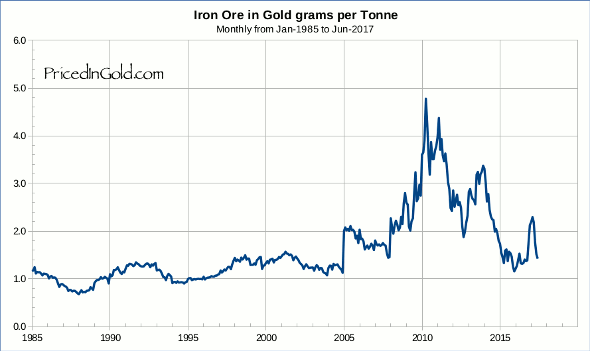 This week's iron ore stories at http://davidstockmanscontracorner.com/why-commodity-prices-are-cliff-diving-the-iron-ore-collapse-reflects-the-end-of-the-monetary-super-cycle/ and http://www.forbes.com/sites/timworstall/2014/12/29/why-crude-oil-and-iron-ore-will-continue-to-fall-in-price-in-2015/ probably wouldn't have been written if they were looking at this iron ore priced in gold chart. I don't know why you say that, PRice. The chart above shows that iron ore still has room for about a 50% drop (from 2 g/t to 1 g/t) to get back to historical levels before the market started going crazy in 2005.